The Auctions America Southern California sale was held July 17-18, 2015 at the Barker Hangar in Santa Monica, resulting in $15,477,487 in total sales and a 58.46 percent sell-through rate. The multi-day auction lifted the gavel on approximately 300 collector vehicles and select memorabilia. Bidders hailed from 11 countries around the world and 43 percent of bidders represented first-time clientele. 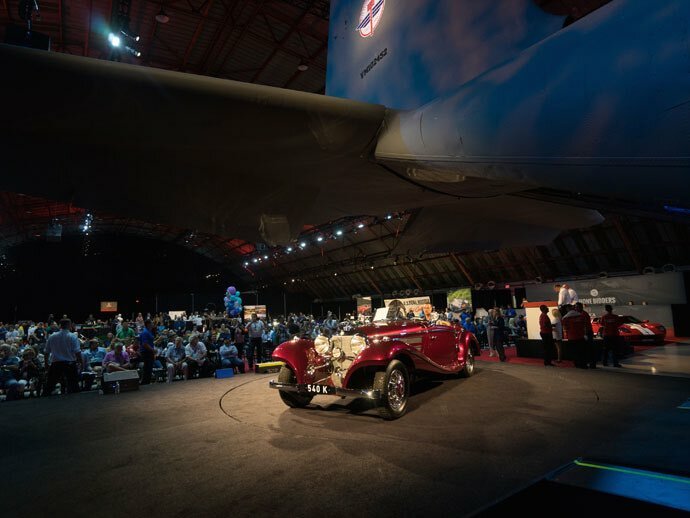 Held for the first time at Santa Monica’s historic Barker Hangar, the Auctions America California 2015 sale delivered a new take on automotive auction staging, with vehicles driving onto the auction podium via the tail section of a C130. 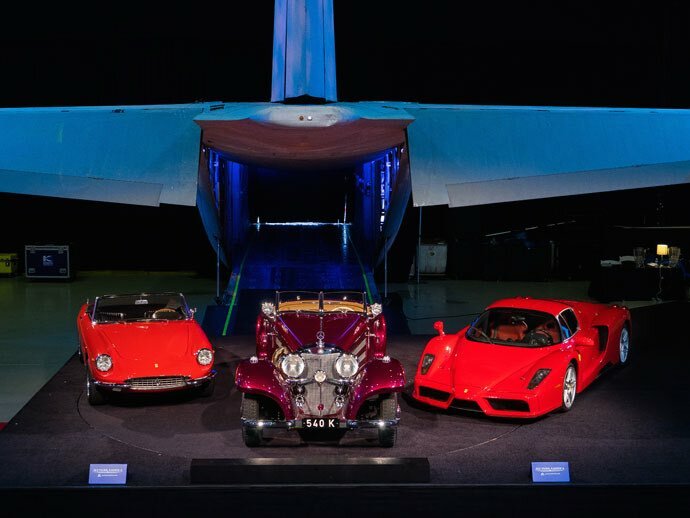 Top sales honors were tied by two cars from different eras – a 1938 Mercedes-Benz 540K Special Roadster and a 2004 Ferrari Enzo. Originally built as a 540K Cabriolet B before a re-body, the 540K made $1,870,000. 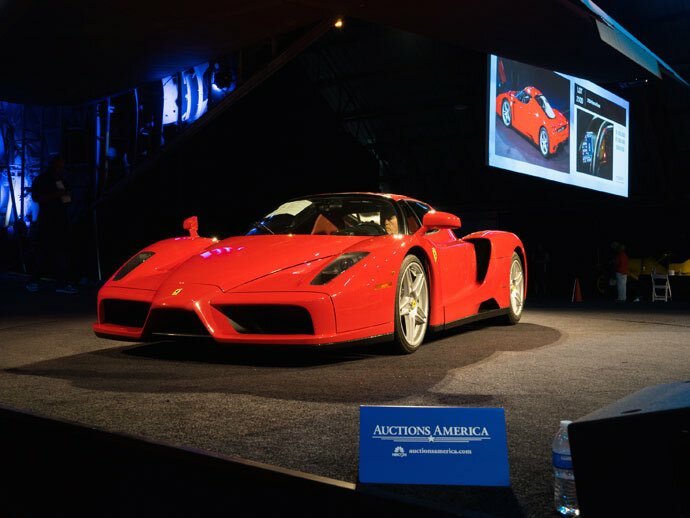 The Enzo also drew attention, selling for a final $1,870,000. Rounding out the sale’s top three and also achieving seven figures was the 1967 Ferrari 330 GTS, which realized $1,622,500. Further notable sales at the 2015 Auctions America California sale included the 1971 Mercedes-Benz 280 SE 3.5 Cabriolet for an above-estimate $407,000, a 1989 Lamborghini Countach 25th Anniversary Edition, showing 6,500 miles, for $360,250 and the 1955 Ford “Beatnik Bubbletop” Custom, the world’s largest bubbletop custom car, offered by star of A&E’s “Storage Wars”, Barry Weiss, for $165,000. In addition, solid results were also recorded for a variety of Porsches included in the sale. A freshly restored 1972 Porsche 911T Coupe in Gemini Blue Metallic commanded $140,250, a 1996 Porsche 911 Twin Turbo garnered $165,000 and a 2007 Porsche GT3 RS sold for $192,500. For complete auction results, visit AuctionsAmerica.com. Auctions America continues its 2015 calendar with its Auburn Fall Collector Car Weekend, September 2–6. Returning to the historic Auburn Auction Park in Indiana, this multi-day event will lift the gavel on some 1,000 collector vehicles, in addition to presenting a car corral, swap meet and a host of other automotive-themed activities. Auctions America concludes its 2015 calendar with its debut Hilton Head Island Auction, October 31 in South Carolina, during the Hilton Head Island Motoring Festival and Concours d’Elegance. For more information, visit AuctionsAmerica.com or call 877.906.2437 (+1 260 927 9797 outside of North America).